Schefflera – the original tree of the plant family Araliaceae with dark green leathery leaves, which are clustered in a characteristic "umbrella". 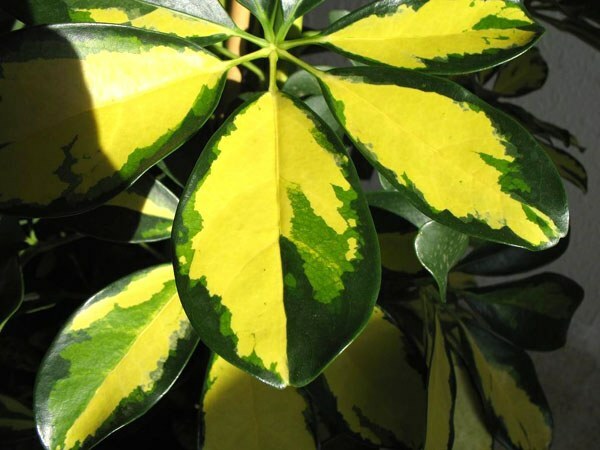 There are also variegated types with white and yellow spots. Homeland plants – the humid subtropical forests of South-East Asia. In the indoor environment with good care schefflera can reach 2 m in height. To avoid overgrowth and form a magnificent crown, the apical shoots of trees cut. Of these shoots, you can try to grow sheflera. So, pruning Scheffler took place, and you've got a long-awaited shoot apical. With a sharp knife cut it into cuttings approximately 10 cm long, Put them in a jar with boiled water. To avoid rotting, it is recommended to add water, a little powdered activated carbon. Cover the jar with plastic transparent package that the liquid will evaporate less rapidly. Put in a warm (22oC), moderately lit place. From time to time check the condition of the cuttings Scheffler. After about a month you'll see the characteristic bumps, indicating that the growth of roots began. Do not rush to plant the cuttings in the soil – for them it will be a lot of stress. Wait for the formation of the linear roots of sufficient length. Prepare the pots. They should be small, as schefflera will begin to give new shoots as long as its roots do not learn the whole volume of the pot. For growing Scheffler requires loose soil. If you get ready the earth at the flower shop, take the soil for trees. If you mix the substrate independently, take three parts humus or compost soil, one part peat and sand. Be sure to sprinkle on the bottom of the pot layer of expanded clay for drainage. Plant cuttings Scheffler in the ground. To better through this process, the roots can be slightly opurity kornevina. Look for plants warm, but not hot (16 to 22) a place with multiple light. Variegated types need more light and heat. Care Scheffler simple. Water the seedlings regularly, but moderately. The Bay will inevitably lead to their death. Between watering the top layer of soil needs time to dry out, but in any case, do not allow complete drying earthen coma. The plant does not tolerate dry air, so it is recommended that regular spraying. Fertilize sheflera special complex drugs for dekorativnolistnye plants once in two weeks during the period of its intensive growth, which begins in April and lasts until September. Immediately after planting the cuttings Scheffler in the ground to fertilize is not recommended – you risk to burn the roots. Make fertilizer only after you start the process of active formation of new shoots. In the future, as opletnya clod of earth with roots, transfer the plant into a new pot, the diameter of which is greater by 10-20%. Scheffler, the young plants are transplanted each year, older plants – every 2-3 years. To root can and leaves Scheffler, however, they will remain sticking out of pot leaves. In order to grow a tree, you need at least a few inches of the barrel. Winter sheflera is recommended to ensure the lower temperature (14 to 16оС for variegated species – not less than 18 o) and reduce watering. However, in urban conditions in the presence of Central heating make this often impossible. Therefore the plant should continue to exist "for the summer schedule." Place it away from heaters and protect from drafts. Regular watering and spray, as well as organize additional lighting fluorescent lamps.